Basic Aircraft Products has the BAE-14/28 turbo alternator available for Mooney M20 Aircraft. For more information on the Mooney M20 Aircraft please use the links below. The "M20" was the twentieth design from Al Mooney, and his most successful. The M20 series was produced in many variations over the last 50 years, from the wooden wing M20 and M20A models of the 1950s, to the M20TN Acclaim that debuted in the 21st century and is currently in production. 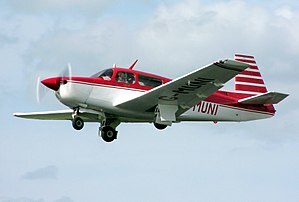 The Mooney M20 series has been produced in three fuselage lengths: the "short body", "medium body" (including M20J), and "long body" types. Only the long body Mooneys are in current production. Although all M20s have four seats, the fuselage length increase provided more passenger legroom but with a slight performance decrease. Other airplane improvements over the years more than compensated for the effects of a longer fuselage. The above content is based on the copyrighted Wikipedia article Mooney M20; it is used under the Creative Commons Attribution-ShareAlike 3.0 Unported License (CC-BY-SA). You may redistribute it, verbatim or modified, providing that you comply with the terms of the CC-BY-SA.